We have crossed into December, and the countdown to Christmas is officially underway in our house. Our tree was standing for over a week without ornaments until last night. It’s a prelit tree, but it looked a little odd with the middle section blacked out for several nights in a row. That’s one of the issues you run into when you have a lot of ornaments that plug in. Last night we finally added the ornaments. My wife has found time to add little things all around the house. She bought some new LED candlelights online for each of the windows. Some faux brick cardboard lines the walls of a sitting room, trimmed neatly with puffy white “snow” and all of our stockings. And we hung some paper snowflakes from the kitchen ceiling. This Sunday, though, I get to do something I rarely have the opportunity to anymore: lead worship. It probably seems silly that a guy who wrote a book on worship suddenly finds himself out of the role. But part of the role I do fill now, as assistant pastor, requires filling in where other needs are, since we have a number of worship leaders in the church. There’s just one hitch, leading worship during the month of December. How do we do justice to the season and still come out feeling like we’ve worshiped? Many worship leaders and pastors fill the worship section with Christmas carols for the weeks leading up to Christmas. It doesn’t help that there is no shortage of songs that are available, and there is always at least one person who likes each one. Don’t get me wrong; the songs of Christmas fill an enormous role in our worship. I was taught once that the hymns provide us with a wealth of theology. The carols are no less important. It is important to be reminded of how angels announced the birth of God in flesh, born that man no more may die. We have tendency to build our worship, our services, our religious experiences, around themes. I only think that we miss an immense opportunity to build our worship out of these great truths. In the interest of time, allow me to share some of my thoughts when it comes to worship at Christmastime. 1) Use the carols, don’t be used by them. Find one song to build your worship experience upon. We have an abundance of songs that are never sung from week to week. Why throw the whole filing cabinet aside for three or four weeks in the year? The key to this point is to understand the point of the song. My favorite Christmas song is O Come, O Come, Emmanuel. It is the cry of a people (the Jews) who are spread throughout the world, looking for God to rescue and restore them through the Messiah. What power there is when we understand the meaning of a song. In this case, how simple is it to move into thoughts of the “Light of the world [who] stepped down into darkness” (Here I Am To Worship, Tim Hughes, © 2001 Thankyou Music)? Or take O Come All Ye Faithful, where the cry is “O come let us adore Him,” to move into “Let us adore Him, Jesus Christ, is the Lord” (Let Us Adore, © 2005 Reuben Morgan / Hillsong Publishing). 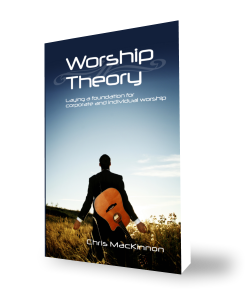 2) Worship must still be worship. We have to guard against performing a show at a time when the show is easily accessible. Don’t forget that the whole world is attaching itself to the glitz of Christmas. Don’t let your worship service be transformed into a Christmas marketing campaign. Another way of looking at it is that we have the opportunity to show seekers what church is all about. Christmas is one of two times in a year when we can count on unchurched people to sit in our pews. Why not give them a true taste of what church is the rest of the year? If we believe that the power of God is in our services the way we typically see them through, why change that just because we are in a different season? Shouldn’t we want to bring down the power of God so that those who haven’t experienced Him can do so? Let me close off with a quick note. My first Christmas at my last church, the pastor expected me to lead in a number of carols for worship that December. The first Sunday he looked over my worship list, saw only one Christmas song to open, and kind of gave me one of those “I have a bad feeling about this” looks. After the worship, during a customary prayer time, he asked for forgiveness in losing sight of what this time of year is all about. The angels announced the birth of Christ to shepherds, who found Him and worshiped Him. Magi from the East travelled across a continent led by a star, so that when they found Him, they might worship Him. Don’t get so caught up in the hype that you end up losing sight. The key to worship at Christmastime is to worship.